Varies from low 8’s to mid 9’s per training schedule at the time. George Sheehan’s “Running & Being” & Runners World on-line. Lots of folks from the Jackson Running Club. Qualifying 1 time for the Boston Marathon. I accomplished that last year. I ran a marathon in my 20’s, 30’s, 40’s & 50’s. I want to run a marathon every decade into my 90’s. I want to stay healthy, strong & energized into old age. I also want to run races with my grandchildren. I run because I love it! It keeps me healthy, strong, and happy & gives me energy out of this world. It also has brought me many friends which in turn makes me a better runner & a better person. I also like to motivate my own family & friends by showing you can excel in exercising & achieve goals at any age. 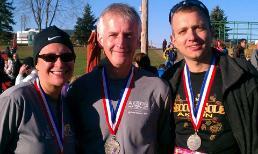 Last year at the age of 53, I qualified for the 2013 Boston Marathon with a time of 3:29:57. 3 seconds to spare. I ran with the 3:25 pace group through 19 miles until I couldn’t turn my legs over quick enough to stay with them. I went into my own zone & focused on earning my shower. My 2 sons Tim & Jacob encouraged me in the 25th mile by yelling NO PAIN to me. That helped a bit. My training from Runners World, TrainingPeaks was the ultimate payoff for me. I used the sub 3:30 plan & what a plan that is. Lots of speed, tempo’s Yasso 800’s & long runs paid off in the end. When I turned the final corner in Columbus, I knew it was close for a sub 3:30 & I went into an all out sprint the last quarter mile to Boston qualify by a mere 3 seconds. I was strong & very happy with that finish. I laid everything on the line & earned my shower! I wanted to be on the Canton Pace Team because I ran my 1st marathon at the age of 27 in 3:59:10 in Cleveland. I was very happy to go sub-4 & I want to see how my pack of runners reacts when they cross the finish line. I also designed the courses for Canton & spent many hours on this huge task & many last minute changes before the initial Canton Marathon Expo. I love running with pace teams & I’m very consistent with my goals. This will also keep me honest. The 2011 Akron Marathon was a training run for Columbus 3 weeks later. I went with the 3:45 pace group with Josh as our pacer. Josh was the best pacer I’ve ever ran with. We ran a negative race & picked it up after 10 miles in & from mile 20 on, I took off over 2 minutes off the goal of 3:45, and I finished with a 3:42 & change. Josh is an ultra marathon & he loves to eat. He said you must eat when you run his schedule. Josh was a lot of fun & he would always pull the rabbits back into the pack keeping our group in check. Our pack was down to 2 men, 2 women & Josh. Josh told us at mile 24 to go get it & we did. This race I was strong & never had any issues at all & had a blast with our pace group. I also liked how the Race Director shook every marathoners hand at the finish line. What a class act! I’ve been running since I was in junior high & I know all the ups & downs over my career. I will keep our group at an even pace the whole way & we will have fun. I know how to motivate & coach others while in the run. I will be the cheerleader out there without a doubt & our group will be in on-time. I also know some running members from the Jackson Run Club who want to go Sub-4. We communicate via the Canton Marathon Face book; Jackson & North Canton run clubs face book pages. We meet on Thursdays, Saturdays & Sundays & train together. If I get the 4 hour pace duty I will encourage the 4 hour pact to run with me on Sunday’s. They need to have a training plan no doubt. They need speed & long runs. I will do my best to get them to their goals. I will coach them with how to run hills. Keep vertical, don’t lean forward, push off hill with your legs, pop up like your running on springs & then let your self go on down hills. I learned that from Runners World TrainingPeak training schedule. George Sheehan had a tip I still use. When you are in pain with stitches or anything, groan when you exhale. It relieves the tension in your body & it does work. Use Gu in your training & race. It’s a must & I will encourage runners to use it on race day. I also will tell them to use Accelerade from GNC 5 days prior to race day & one the morning of the race. I also used compression socks & shorts my last 2 marathons & they absolutely work. I lead my life at work, home & running life as a leader. We need to set our goals high & not settle for anything less.